Representative McCarthy, whose district includes the Mojave Air and Space Port, cited Yeager and Reagan in comments on entrepreneurship, public-private partnership, innovation, and American exceptionalism, concluding with the sense that in an America with “curiosity, confidence, and drive”, thousands more sets of wings are coming. Sir Richard, chair of the Virgin Group, effused all the enthusiasm gained from a dream realized. The Briton both applauded US efforts and leadership, while also placing the life-changing potential that the democratization of space represents into a global perspective. Sir Richard thanked the pilots and “exceptional others” for their efforts in making commercial spaceflight a reality. Secretary Chao, who preferred to address the pilots by their callsigns (their given names are Mark P. Stucky and Frederick W. Sturckow), called the present era of growth in commercial launch systems “The Rocket Renaissance”. The Secretary also touched briefly on a policy goal to streamline the present FAA regulations, which separately licence launch and reentry activities at particular spaceports, to a streamlined system with one licence per spacecraft, regardless of the operating base. 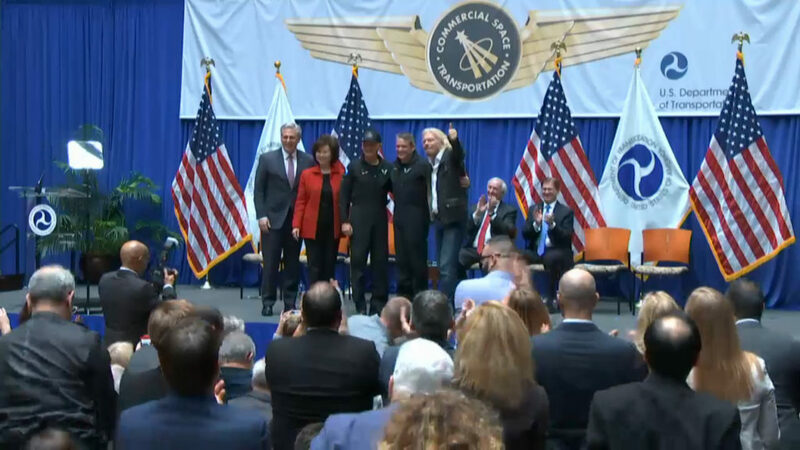 At the conclusion of the remarks, Secretary Chao pinned the wings upon Forger and C.J., with McCarthy flanking Chao and Branson beside each pilot in turn. The pilots themselves did not address the crowd of distinguished guests and middle-school STEM students, though in some ways, the image of gold pins sparkling over the right chest pocket of two Virgin Galactic flightsuits is a statement as loud and clear as the roar of the engine that carried them into space on a Mojave morning just eight weeks ago. Though several private astronauts have paid for Russian flights to the International Space Station, US commercial astronaut wings have not been awarded in the 15 years since Mike Melvil and Brian Binnie piloted SpaceShipOne flight 15P. The next award should come much sooner; commercial spaceflight companies Virgin Galactic, Blue Origin, SpaceX, and Boeing, all based in the United States, each have at least one manned spacecraft that is flight proven or scheduled to fly in 2019.